Reverend Al—we know him. We know who said “Can we all just get along?” and we know the recent Michael Brown verdict. How’s America doing on race relations today? 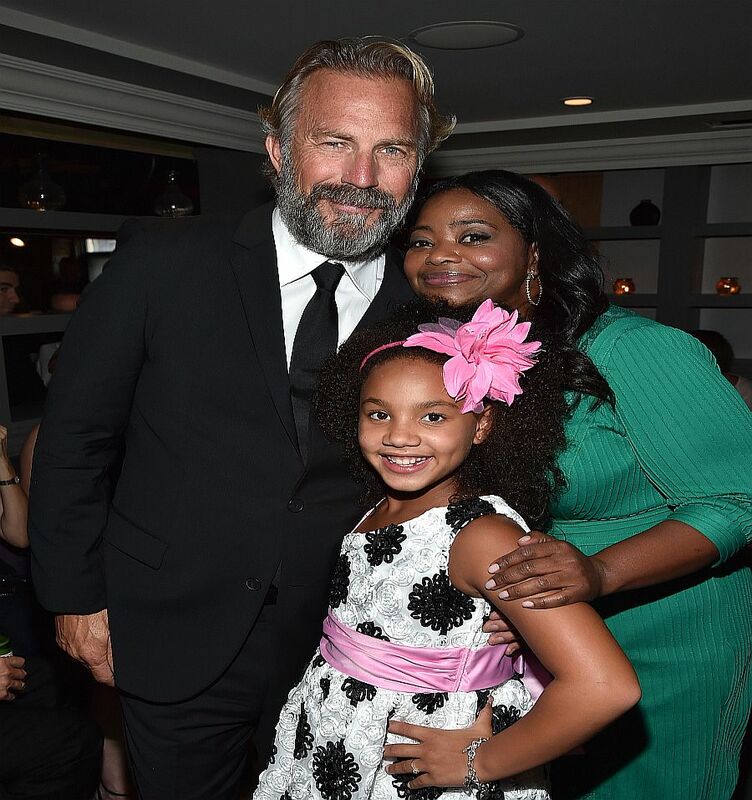 “Black or White” is about whether a little biracial girl, after the car-accident death of the white grandmother who raised her, should now continue to live with her white grandpa Elliot (Kevin Costner), or go live with black grandma Rowena (also known as Wee Wee, and played by Octavia Spencer) and her little cousins in South Central L.A.
Black dad Reggie (André Holland) wants his daughter back. But he smokes crack. White granddad Elliot wants her too, but he’s a drunk. Black or white? Elliot is also an upscale West L.A. lawyer with a Cadillac Escalade, and he drives little Eloise (Jillian Estell) to a Brearley-like private school. He helped raise Eloise her whole life. The black side of the family, however, provides an identity-affirming milieu and extended familial community. They’d have no problem brushing Eloise’s “unruly” hair. White grandma didn’t either, but Elliot has a black hair-brushing skill set to learn. It all got started when Elliot’s apparently adventurous daughter had a fling (feels contrived), got pregnant by her crackhead boyfriend Reggie, and died in childbirth (also feels contrived). Dad Reggie’s a serious deadbeat with a rap sheet and a powerful addiction, who was never interested in Eloise, but now is very interested in the money Elliot offers him to move far away. Elliot tries to remedy the whole messy child-rearing situation by hiring a ridiculously overachieving African math tutor, and refilling coffee mugs with liquor, each and every scene. Meanwhile, down South Central way, Grandma Rowena, a self-made matriarch who runs multiple business ventures out of her garage, retains her brother the attorney (Anthony Mackie) to get custody of the child. She and Elliot had heated discussions, and now she’s feeling litigious. As Elliot’s legal team put it, “We can get a lot uglier than they can.” Really? Probably. But the black team’s going to try and quietly tag Elliot as a racist. Here we go. When it all ends up in court, there are some fun, if egregiously stereotypical showdowns of the finger-waving, side-to-side King-Tut head-wagging variety, between Rowena and the black female judge because Grandma Wee Wee can’t manage to zip it. They’ve pitted Elliot against Reggie—Rowena having convinced Reggie that he needs to want his daughter convincingly in court, for them to get her back. Reggie spells his daughter’s name “L-O-E-Z-E,” and Costner as Elliot delivers the finest monologue (under cross-examination) of his storied show business career. Black or white? Now, Elliot had earlier in the movie hollered the N-word at Reggie, at a time of extreme duress, only to have it come back and bite him in the tuchus in court. As does the attempted payoff to get Reggie out of town. But Costner’s show-stopping monologue deconstructs political correctness, and makes a smack-your-forehead common-sense point about the difference between noticing someone’s race versus actual racism. Juxtaposing “There’s a destitute black man smoking crack,” with, “There’s a functioning-alcoholic privileged white male in denial of his alcoholism,” is of course heavy-handed, but we understand that—never mind the crack and the booze—neither Reggie nor Elliot is a bad person. It takes, however, an unfortunate soap opera-level dramatic mishap involving a swimming pool and mouth-to-mouth resuscitation to help them resolve their issues. That’s unfortunately heavy-handed too. Aside from the spot-on, understated performance by Paula Newsome as the judge, Costner holds it all together. He’s had his golden-boy jock years, and while he’s always been supremely watchable, as his looks succumb to middle-age spread—his acting chops have escalated. The characters of the modern workplace comedy, like the rest of us, don’t know how to make a living anymore.